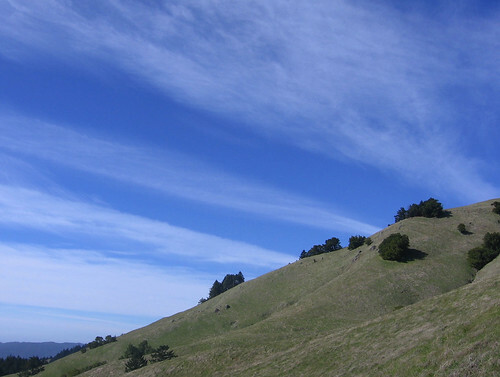 Mount Tamalpais is the biggest hill in Marin County, which is just over the Golden Gate Bridge from San Francisco. I’ve been meaning to check out the trails there pretty much since I first began hiking, but the long drive (two hours from front door to trailhead) and the presumed throngs of San Francisco/Marin hikers gave me an excuse to put it off. I had President’s Day off on Monday so I decided what the heck, let’s cross this one off the list of unvisited state parks (only about a zillion to go, California’s run rampant with ’em). The hike I’ve heard the most raving about is the Steep Ravine Trail/Matt Davis Trail loop, which I did, but just for the heck of it I went up an old railroad grade to the East Summit, where the view is awesome. You can drive to it, too, but what fun would that be? 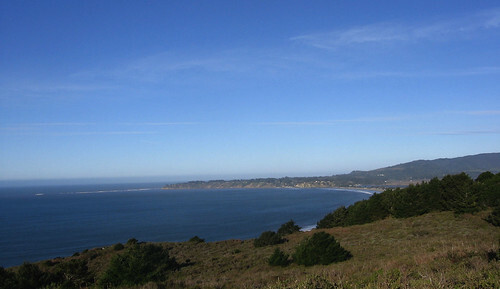 The Pacific Coast at Stinson Beach, just north of a stretch of the Dipsea Trail (which goes all the way to Mill Valley) that connects to the Steep Ravine Trail a little over a mile away. If, like me, you’re a tightwad and don’t want to pay to park in the state park’s lots, you can start out at one of the many parking areas along the Panoramic Highway that cuts through the park. I found one about 50 yards from Highway One, and from there it was uphill all the way to the summit. Funny how mountain hikes work that way. The trail sign for Dipsea Trail mentioned it was just over a mile to Steep Ravine Trail, so that’s the way I went. The first half-hour on the way to the Steep Ravine Trail is fairly unremarkable but things liven up a bit after the turn-off. The trail follows a creek for a couple miles to the Pantoll trailhead, which has a spiderweb of trails going every which way. 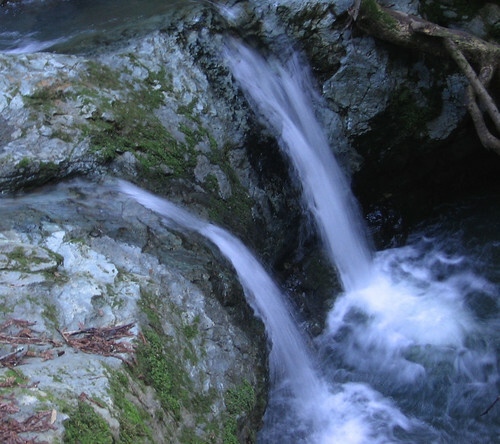 If you like taking pictures of water pouring over rocks, Steep Ravine is the place to be. 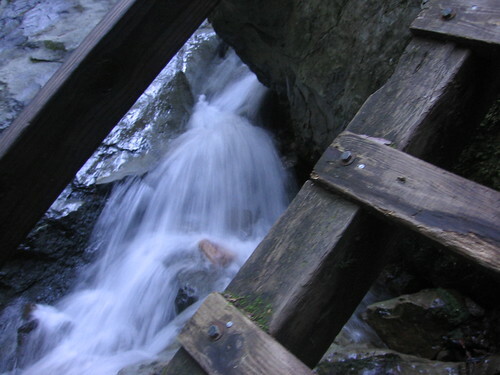 This ladder is a famous landmark along the Steep Ravine Trail. it’s not so tricky to go up but I imagine coming down might be another matter. Having a little waterfall nearby eases the stress. Your standard “water framed by old wooden contraption” shot. The falling water is the highlight of the Steep Ravine Trail — which is pretty steep, by the way. It’s tree tunnel all the way, which makes photography problematic for people who are too cheap to buy good camera gear and too lazy to set up tripods and fiddle with exposure settings. 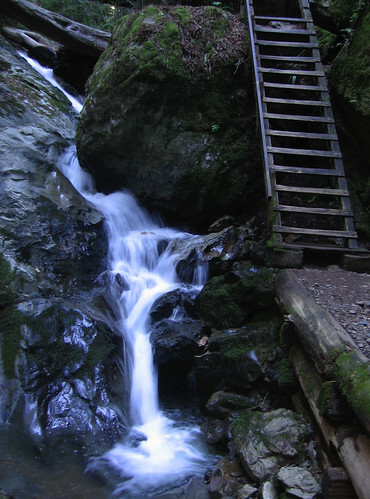 But if you’re into hiking under thick forest canopy and love the sound of water pouring down a hillside, you can’t go wrong at Steep Ravine: it’s among the finest of its kind in the Bay Area (especially on hot summer days). Those are the Steep Ravine highlights. I’ve neglected to mention how I had lucked out in several ways: 1) gorgeous blue skies; 2) very little fog; 3) a bike race through the park keeping the crowds off the trails. As I wandered around the Pantoll area I noticed a road sign which said the mountain’s East Summit was only four miles distant, so I started heading in that general direction — the area around here is almost always fogged in, so a day with a clear view practically begs for taking it all in from the highest ground. I made my way to an old railroad grade that seemed to be heading eastward, and figured what the heck, it’ll be the easiest way to the top. Which it was: a gentle grade and plenty of room for passing mountain bikers to zip past. A veritable hiker Interstate. I was at the summit in no time. 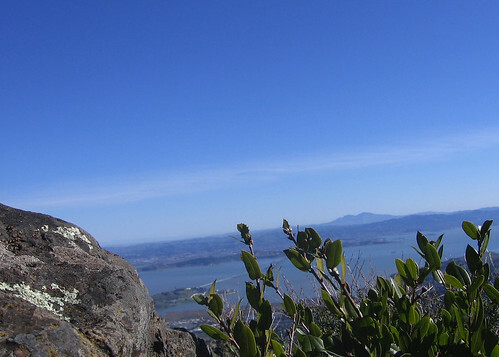 And, of course, of the first things I saw was Mount Diablo, Mount Tam’s taller cousin across the bay. Once again the High Sierra was faintly visible. 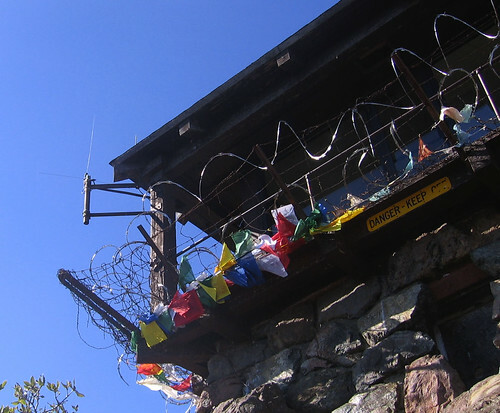 The fire lookout at the East Summit is festooned with flags for decoration and razor wire to keep morons from climbing up there. There’s no access to it, but I heard one hiker telling another that she’d been up there when the ranger was in the tower and had gotten the grand view. With it closed, we had to pick our way through the rocks nearby and find handy picture-taking perches. They were plentiful. You get a strong sense of being above it all up here. And, thankfully, it’s far enough away that civilization looks like someplace you might actually want to visit, rather than flee for your life to avoid. 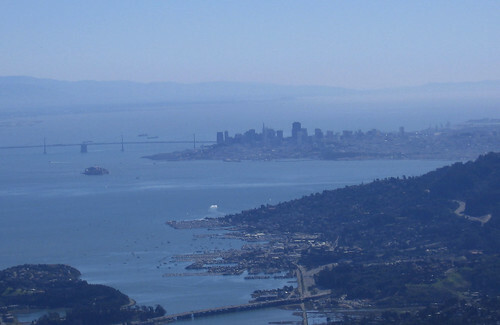 Looking northeast toward the upper reaches of the San Francisco Bay. Looking northwest toward Marin County and the Pacific Ocean. Heading back down the old railroad grade toward Pantoll. The haze over the coastline is as light as I’ve ever seen it. 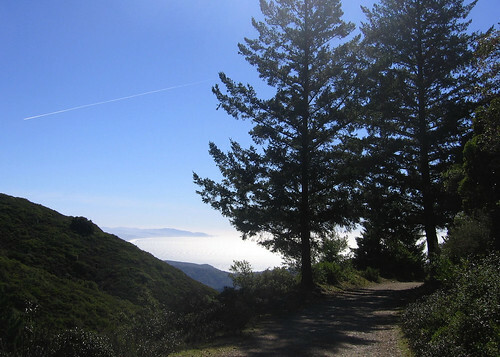 Once I got back to Pantoll, I picked up the Matt Davis Trail, which threads its way down to its Stinson Beach trailhead. A standard tree-cover shot along the trail. The forest canopy isn’t quite as dense here, compared to Steep Ravine, which is fine by me. A few sections of the Matt Davis trail open up to excellent views of the hillsides. 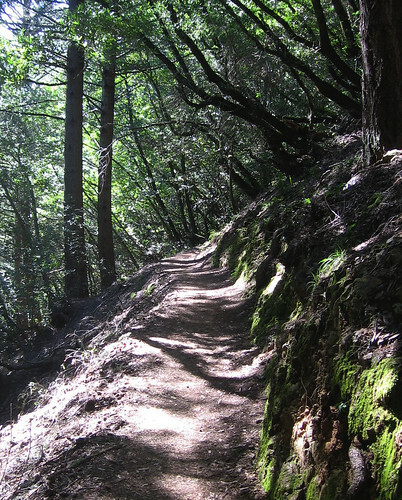 Heading downward, the Matt Davis trail is deceptively gentle for the first couple miles, but the last mile down to Stinson Beach is really steep (especially after you’ve hiked 14 miles), even with lots of switchbacks. 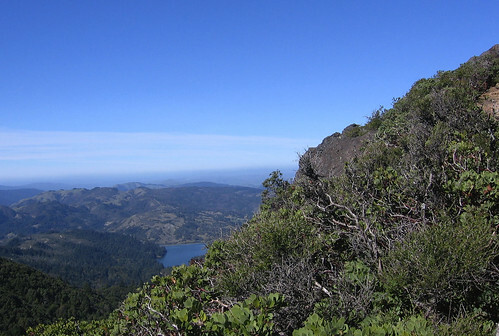 Mount Tam is one of the most-visited parks in the Bay Area, so it’s hard to get that sense of being out there in the wilderness that you might get in the far reaches of a park like Henry Coe. It’s also a painfully long drive for us South Bay types. But on the right day, with clear skies and gentle ocean breezes, it’s a great place to be. Thanx … definitely a long haul from San Jose; probably passed a hundred trailheads on the way there. I like Point Reyes even better, but that’s even farther away. Love your site; I found it about a month or so ago. 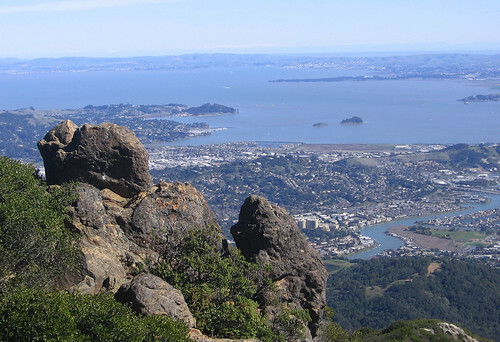 Especially enjoyed this post since we used to live in Marin and spent time hiking here, Phoenix Lake and China Camp. Thanks, you certainly missed an excellent day for hiking up there last Sunday… turned out the Tour of California bike race went right through the park and most people stayed away, so the crowds were amazingly thin.